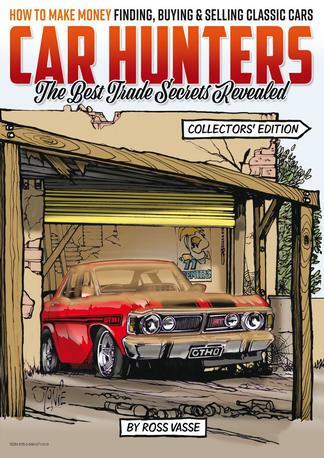 How would you like to learn the best trade secrets to becoming a Car Hunter? I’m sure we’ve all seen some amazing cars for sale of late, classic cars that have been found unloved in sheds, garages and carports then dusted off and listed for sale online, at auction and on Facebook. What if you could be the person to find these classic cars in the first place? Becoming a Car Hunter isn’t hard, and with renowned ‘Car Hunter’ Ross Vasse to show you how, it’s easy. In this publication, Vasse reveals all the best trade secrets on how to find a classic car, how to buy it, and how to sell it for a profit… that is of course, if you don’t want to keep it for yourself instead! You’ll discover a simple step-by-step guide that will show you how to develop your skills, improve your knowledge and quickly gain experience with classic cars. Learn how to trade up from a pebble to a diamond, keeping the classics you like the most along the way. If you love cars, then you’ll love the new book CAR HUNTERS. Hurry as stocks are limited. Once they’re gone, they’re gone! A must have resource to prevent making mistakes when entering the market.